The dusted heroes of Avengers: Infinity War get their own Halloween graveyard tribute display. The month of October has been a pretty good one for Marvel Cinematic Universe fans. The Captain Marvel trailer was released and Marvel Studios boss Kevin Feige has revealed that the Avengers 4 trailer will arrive before the end of the year, which means that we'll see the first footage within the next two months. While waiting for Avengers 4 news, MCU fans have gotten pretty clever with their 2018 Halloween displays. The latest Infinity War-themed Halloween display takes one clever MCU fan's front yard and turns it into a tribute to the fallen heroes. Tombstones are laid out in an orderly fashion, each with the name of a dusted hero. The graveyard features the tombstones of Doctor Stephen Strange, Groot, Peter Parker, Drax the Destroyer, James "Bucky" Barnes, T'Challa, Loki, Gamora, and Wanda Maximoff. There could be more, but those are the only tombstones that can be seen in the picture. Vision's is not shown in the picture, and neither is Star-Lord's. Last weekend, we were treated to what might be the ultimate Infinity War Halloween display. While the graveyard idea is pretty clever, one family took it upon themselves to recreate the scene where Peter Parker turns to dust in the arms of Tony Stark after losing to Thanos on Titan with pumpkins. Tony Stark is made up of three pumpkins and an Iron Man mask, while a Spider-Man costume lays on the ground, with half of his body covered by fresh fall leaves, giving off the illusion that he's turning to dust. That family wins Halloween 2018 so far. The graveyard for the fallen heroes of Infinity War may be a bit premature. Loki, Gamora, and Vision were the only characters who really died on screen, while the rest were all turned to dust, along with half of the universe. Now, many believe that Avengers 4 is going to go back in time to reverse the deaths and dusting, but that has yet to be confirmed at this time. There have been a number of fan theories about where the dusted characters all went, with some believing they're all trapped in the Soul Stone and others believing that they could be in another dimension. Obviously, all of these theories could be way off. 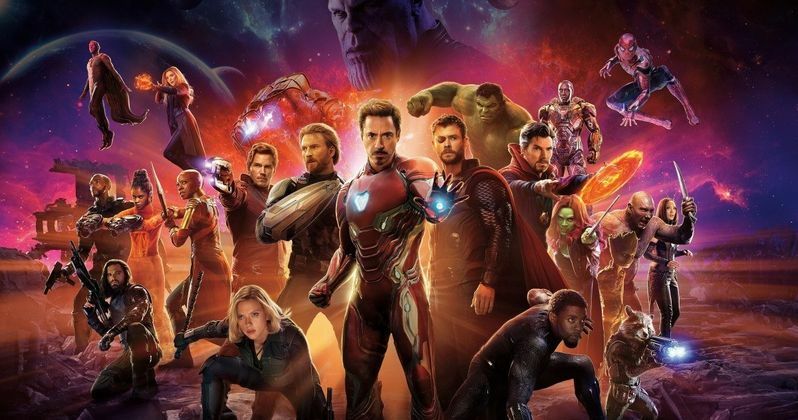 For now, MCU fans are left to guess what will happen in Avengers 4, which is the way that it's supposed to be. The highly anticipated movie hits theaters early next year, so it will be interesting to see how next Halloween is effected by all of the changes that are potentially made. We could see a few more tombstones added to this year's Infinity War graveyard with a few removed as well. You can check out the clever MCU Halloween display over at Reddit and then check out the Tony Stark and Peter Parker display below.